The Greek essayist Plutarch describes Spartacus as "a Thracian of Nomadic stock", in a possible reference to the Maedi tribe. Appian says he was "a Thracian by birth, who had once served as a soldier with the Romans, but had since been a prisoner and sold for a gladiator". Florus described him as one "who, from a Thracian mercenary, had become a Roman soldier, that had deserted and became enslaved, and afterward, from consideration of his strength, a gladiator". The authors refer to the Thracian tribe of the Maedi, which occupied the area on the southwestern fringes of Thrace, along its border with the Roman province of Macedonia - present day south-western Bulgaria. Plutarch also writes that Spartacus' wife, a prophetess of the Maedi tribe, was enslaved with him. The name Spartacus is otherwise manifested in the Black Sea region. Kings of the Thracian dynasty of the Cimmerian Bosporus and Pontus are known to have borne it, and a Thracian "Sparta" "Spardacus" or "Sparadokos", father of Seuthes I of the Odrysae, is also known. About 70 slaves were part of the plot. Though few in number, they seized kitchen utensils, fought their way free from the school, and seized several wagons of gladiatorial weapons and armor. The escaped slaves defeated legions sent after them, plundered the region surrounding Capua, recruited many other slaves into their ranks, and eventually retired to a more defensible position on Mount Vesuvius. Once free, the escaped gladiators chose Spartacus and two Gallic slaves—Crixus and Oenomaus—as their leaders. Although Roman authors assumed that the escaped slaves were a homogeneous group with Spartacus as their leader, they may have projected their own hierarchical view of military leadership onto the spontaneous organization, reducing other slave leaders to subordinate positions in their accounts. The positions of Crixus and Oenomaus—and later, Gannicus and Castus—can be clearly determined from the sources. The rebels also defeated a second expedition, nearly capturing the praetor commander, killing his lieutenants and seizing the military equipment. With these successes, more and more slaves flocked to the Spartacan forces, as did "many of the herdsmen and shepherds of the region", swelling their ranks to some 70,000. In the spring of 72 BC, the rebels left their winter encampments and began to move northward. At the same time, the Roman Senate, alarmed by the defeat of the praetorian forces, dispatched a pair of consular legions under the command of Lucius Gellius Publicola and Gnaeus Cornelius Lentulus Clodianus. The two legions were initially successful—defeating a group of 30,000 rebels commanded by Crixus near Mount Garganus—but then were defeated by Spartacus. These defeats are depicted in divergent ways by the two most comprehensive (extant) histories of the war by Appian and Plutarch. Alarmed by the unstoppable rebellion, the Senate charged Marcus Licinius Crassus, the wealthiest man in Rome and the only volunteer for the position, with ending the rebellion. Crassus was put in charge of eight legions, approximately 40,000 trained Roman soldiers, which he treated with harsh, even brutal, discipline, reviving the punishment of unit decimation. When Spartacus and his followers, who for unclear reasons had retreated to the south of Italy, moved northward again in early 71 BC, Crassus deployed six of his legions on the borders of the region and detached his legate Mummius with two legions to maneuver behind Spartacus. Though ordered not to engage the rebels, Mummius attacked at a seemingly opportune moment but was routed. After this, Crassus' legions were victorious in several engagements, forcing Spartacus farther south through Lucania as Crassus gained the upper hand. By the end of 71 BC, Spartacus was encamped in Rhegium (Reggio Calabria), near the Strait of Messina. According to Plutarch, Spartacus made a bargain with Cilician pirates to transport him and some 2,000 of his men to Sicily, where he intended to incite a slave revolt and gather reinforcements. However, he was betrayed by the pirates, who took payment and then abandoned the rebels. Minor sources mention that there were some attempts at raft and shipbuilding by the rebels as a means to escape, but that Crassus took unspecified measures to ensure the rebels could not cross to Sicily, and their efforts were abandoned. Spartacus' forces then retreated toward Rhegium. Crassus' legions followed and upon arrival built fortifications across the isthmus at Rhegium, despite harassing raids from the rebels. The rebels were now under siege and cut off from their supplies. At this time, the legions of Pompey returned from Hispania and were ordered by the Senate to head south to aid Crassus. While Crassus feared that Pompey's arrival would cost him the credit, Spartacus unsuccessfully tried to reach an agreement with Crassus. When Crassus refused, a portion of Spartacus' forces fled toward the mountains west of Petelia (modern Strongoli) in Bruttium, with Crassus' legions in pursuit. When the legions managed to catch a portion of the rebels separated from the main army, discipline among Spartacus' forces broke down as small groups were independently attacking the oncoming legions. Spartacus now turned his forces around and brought his entire strength to bear on the legions in a last stand, in which the rebels were routed completely, with the vast majority of them being killed on the battlefield. Classical historians were divided as to the motives of Spartacus. None of Spartacus' actions overtly suggest that he aimed at reforming Roman society or abolishing slavery. Toussaint Louverture, a leader of the slave revolt that led to the independence of Haiti, has been called the "Black Spartacus". In modern times, Spartacus became an icon for communists and socialists. Karl Marx listed Spartacus as one of his heroes and described him as "the most splendid fellow in the whole of ancient history" and a "great general (though no Garibaldi), noble character, real representative of the ancient proletariat". Spartacus has been a great inspiration to left-wing revolutionaries, most notably the German Spartacus League (1915–18), a forerunner of the Communist Party of Germany. A January 1919 uprising by communists in Germany was called the Spartacist uprising. Spartacus's name was also used in athletics in the Soviet Union and communist states of Central and Eastern Europe. The Spartakiad was a Soviet bloc version of the Olympic games. This name was also used for the mass gymnastics exhibition held every five years in Czechoslovakia. Numerous sports clubs in the Soviet and the Eastern bloc were named Spartak, such as the Spartak sport society, FC Spartak Moscow, FC Spartak Kostroma (Russia), PFC Spartak Varna, PFC Spartak Pleven, FC Spartak Plovdiv (Bulgaria), FC Spartak Trnava (Slovakia). The film Spartacus (1960), which was executive-produced by and starred Kirk Douglas, was based on Howard Fast's novel Spartacus and directed by Stanley Kubrick. The phrase "I'm Spartacus!" from this film has been referenced in a number of other films, television programs, and commercials. In 2004, Fast's novel was adapted as a made-for-TV movie by the USA Network, with Goran Višnjić in the main role. 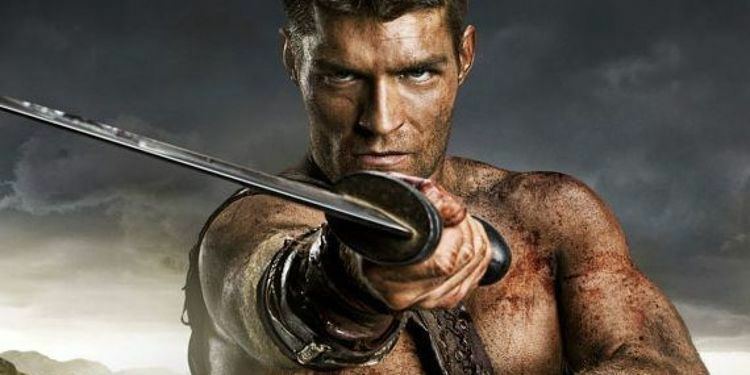 One episode of 2007–2008 BBC's docudrama Heroes and Villains features Spartacus. The History Channel's "Barbarians Rising" (2016) features the story of Spartacus in its third episode entitled "Rebellion". The German writer Bertolt Brecht wrote "Spartacus", his second play, before 1920. It was later renamed "Drums in the Night". The Latvian writer Andrejs Upīts in 1943 wrote the play "Spartacus". The Polish writer Halina Rudnicka in 1951 wrote a novel "Uczniowie Spartakusa" ("Spartacus' disciples"). The Reverend Elijah Kellogg's Spartacus to the Gladiators at Capua has been used effectively by school pupils to practice their oratory skills for ages. Amal Donkol, the Egyptian modern poet wrote "The Last Words of Spartacus". "Love Theme From Spartacus" was a hit for composer Alex North and has become a jazz standard. In 1975, Triumvirat reached the apex of their commercial success with the release of Spartacus, a classic "prog rock" album. Australian composer Carl Vine wrote a short piano piece entitled "Spartacus", from Red Blues. Jeff Wayne released his musical retelling, Jeff Wayne's Musical Version of Spartacus, in 1992. In Age of Empires: Rise of Rome Expansion IV Enemies of Rome, 3: Spartacus the campaign has the player fighting against Spartacus' army. In "Gods of Rome", Spartacus is a playable common character.